Remote Control Cranky the Crane by TrackMaster is the only radio controlled toy that measures nearly 3 feet tall, it’s sure to catch your attention. Relive the exciting adventures from the movie Day of the Diesels with Cranky and Flynn and other friends of Thomas. Kids have fun with Cranky who can completely turn around left to right or right to left and raise or lower his crane. He is able to have Flynn drive into the rescue crate and be moved onto the loading surface. Watch with excitement as Flynn come thru the doors of the crate and onto the tracks to knock over the flame tab which will extinguish the fire and save the day! There is obliviously a bit of imagination required when playing with this toy but that’s what makes Thomas and Friends so much fun, developing imagination and having fun. Build lasting enjoyable memories for a lifetime. Relive the cool adventures of the movie Day of the Diesels with Cranky and Flynn. Together Cranky and Flynn come to the rescue just like in the Thomas and Friends DVD "Day of the Diesels"
•	FLYNN CHARGES OUT OF HIS CARGO CRATE! •	INCLUDES A FULL LOOP OF TRACK! 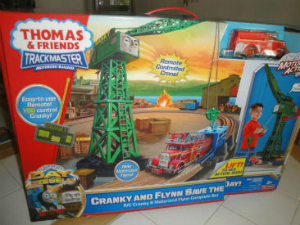 Thomas & Friends TrackMaster Cranky and Flynn Save the Day - FREE SHIPPING!